Good morning. Its a rainy, cold and dreary day here in New York City. 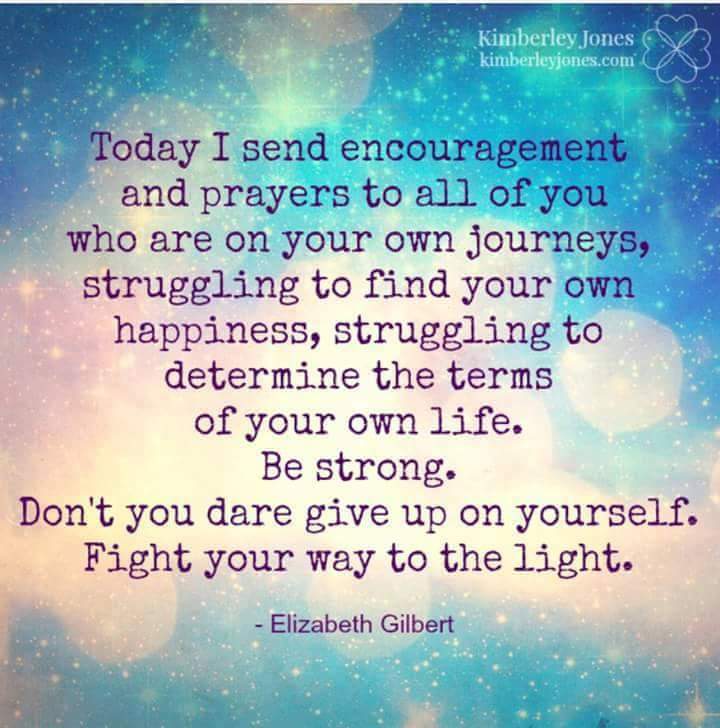 Today I just want to say to anyone who is going through something. Anything it doesn’t matter what it is. NEVER GIVE UP. Things might seem dark right now. You might feel like there’s no way out or that this will never end. Trust and believe that it will. I remember on so many occasions having those feelings. Thinking that what I was going through was the worst thing that ever happened to me. I remember thinking there was no way out and so I gave up. I allowed my negative thoughts to dictate my actions. I wallowed in self pity and the end results were more pain, more misery, more suffering and many, many more problems. In my addiction I wasn’t open to the help that was available to me. I thought that I could do it on my own. THAT I COULD FIX ME. I found out that I couldn’t and If I was ever going to get better that I needed to seek some help. Even after coming into recovery I still struggled. When I was faced with adversity I GAVE UP. I RAN AWAY. I didn’t believe that I could ever be helped, that I didn’t deserve the help and that the people that were trying to help wanted something in return. All of which WAS NOT TRUE. Today I know different, I know because although I kept running away, I kept coming back. I began to believe that I can change and that people can help. I stopped giving up. I stopped running and began to learn how to feel, deal and heal. I found out that my thinking was mixed up and I had to learn to trust the people that were and are doing this. It’s working, all I had to do was try and NOT GIVE UP. So if you are feeling like I did. If you have those voices that keep telling you that you cannot get through this. Don’t believe that. Don’t give up. Don’t stop trying. Don’t quit. The Miracle Is You and you can get through. Thank you, Eric. Your post always have a way helping me. I like what you said, “I stopped running and began to learn how to feel, deal and heal.” I hope you don’t mind if I re-blog your, again. I know it will help my readers. Thanks. Thank you Dale. No please feel free to reblog I appreciate the support and if it helps your readers too by all means go right ahead. I am sorry to hear about the damage that has happened to your greenhouse, storage box. I am grateful that my posts along with the support from your group has helped you to not give up. Yes it is cold here too so like you said it probably better to wait for warmer weather before you start. I will pray for you and that your situation gets better. Thank you for sharing this and for your support. Strength has a way of presenting itself when you need it the most. All you have to do is stay on the lookout. You are doing good! Thanks.